The topic for this post may be somewhat different from others on this website. Many of the other posts describe items or elements of decor that are more or less permanent,- meant to help create a certain style, atmosphere,- a certain je ne sais quoi, if you will, to help make one’s home or landscape part of that Tiki Island Life. Items for a Hawaiian themed party, or Tiki party, however, are more likely to be temporary,- for the event itself. One thing that someone who appreciates and strives for the Tiki Island “lifestyle” enjoys almost as much as the various items and pieces that helped create it, is sharing it with others. A great way to do that is by having a Tiki party,- a Hawaiian Luau! For nineteenth century Hawaiians, Luau wasn’t just a big party. There was significant meaning associated with it. In a sense, it marked the beginning of a new cultural path. Prior to that, since ancient times, women and men did not share their meals together due to social and religious protocol. Also, there were certain foods that were reserved for royalty and not to be consumed by others. In 1819 King Kamehameha II broke tradition and established a new practice by feasting with the common people and with women. The Luau was born! These events were held to celebrate significant events, and were often quite large (attendees sometimes numbering in the thousands). While your Hawaiian luau may be held under less auspicious circumstances (and probably without thousands in attendance), you can still capture a bit of that Polynesian feeling with carefully selected luau decorations. Assuming you’ve already graced your domecile and immediate environs with tiki torches, garden statues of tiki figures and perhaps even a tiki hut, it is time to look to some additional items to complete the overall tableau for your celebration. The choices are myriad. 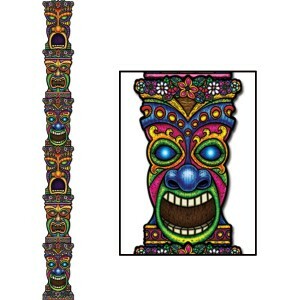 Just check out the incredible variety of luau decorations available! Since much of this website is about “Tiki,” it may be good to consider supplemental tiki decorations (just to fill out the look).Relatively inexpensive tiki decorations can enhance and complete a luau party. Since decorations are likely to be simpler and lighter than, for example, a tiki statue, and not require as much consideration in their placement as a tiki torch, they can serve as very useful ornaments just about anywhere. With a bit of imagination you’ll be able to find just the right spot. 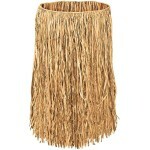 Another element that virtually shouts “tropical-Polynesian-South Seas” is a Raffia Table skirt. While it’s not quite in the same league as a Tiki Hut, it does transform virtually any table into an unmistakable part of any luau. With a table thus adorned you can lay out your tropical delicacies with full confidence your guests will feel transported to an island paradise, and may even be able to describe the delightful scent of the surrounding ocean air. Since it is your luau, you may wish to consider adorning YOURSELF! Of course there isalways the seemingly ubiquitous Hawaiian shirt, but for those of you who may be a bit more adventurous, consider the grass skirt and coconut bra (I’m guessing just for the women, but then I really don’t know the kind of party you might want to have). 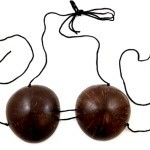 Depending upon just how authentic you want to get at your luau, you may want to fully inspect these items for, shall we say, structural integrity. We wouldn’t want any clothing malfunctions to spoil your event. The “piece de resistance” for your luau or Tiki party may be some authentic sounds of the South Seas,- music, of course. Music, as we all know, has a very powerful effect and, perhaps more than anything else, can transport one to another time and place. In this case we want it to transport us to our Tiki Island Life! Just turn on the music, get that grass skirt swaying and before long, you’ll probably have everyone at the luau moving in time to that sultry sound! 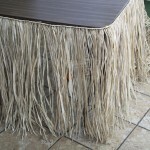 Of course, as I’m sure you know, this is just a small sample of the kinds of things you might want to consider to enhance your environment for your luau or tiki party. The choices are almost endless, depending on how far you want to go. Some other obvious choices might be a Tiki centerpiece or a Hawaiian floral centerpiece, Tiki light strings, floral leis or even tropical or Hawaiian murals. It really all depends on what you want,- what will get you closer to your very own Tiki Island Life.